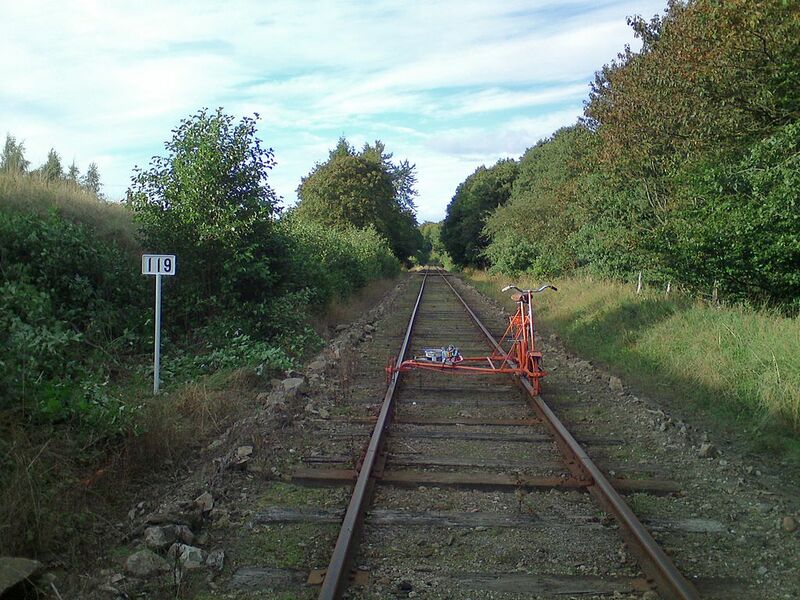 Can a normal bicycle be adapted as a draisine (to use on abandoned railways with the tracks in place)? For a long time I've wanted to rent a draisine and ride it down an old abandoned railway. There's dozens of places in Scandinavia where one can do so. 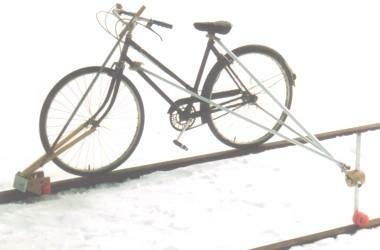 Alternately, is it feasible to adapt an ordinary bicycle as a draisine? Preferably in an easy way so I can ride to an abandoned railway, attach some stuff, and continue onto the railway. Do any kits to easily convert a regular bicycle into a draisine exist? 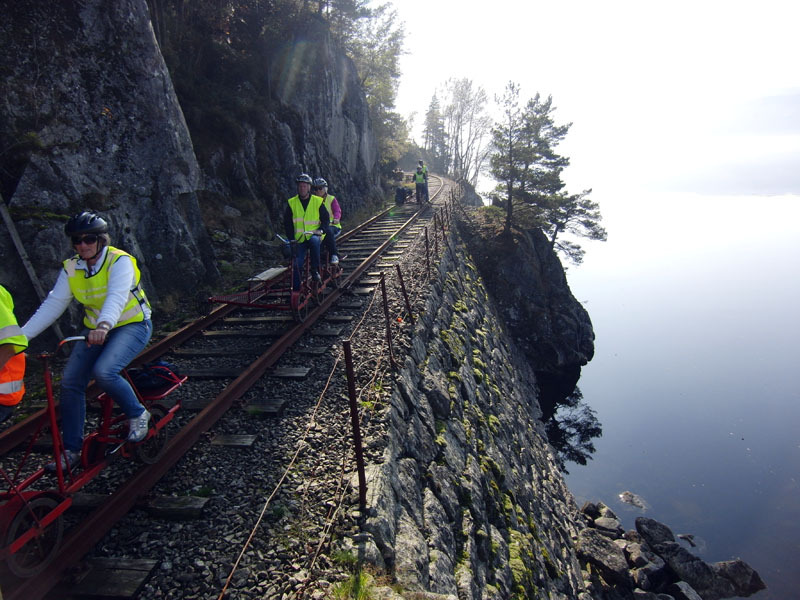 Yes a regular bicycle can be adapted as a draisine or a railbike as we call them (to use on abandoned railways with the tracks in place)? California, USA is big into this sort of thing. There are more books on the subject than websites to be sure of. Although there are so many styles of railbikes out there, it would be quite difficult to know what would fit your needs, but I am fairly confident this site will be able to help you: Bentley Railbike CONSTRUCTION PLANS. They offer Bentley Railbike CONSTRUCTION PLANS for sale and they look like they are detachable, but you should confirm this with this company via email, writing or by phone to verify your needs. CONSTRUCTION PLANS include 6 pages of text with detailed construction sequence and parts list keyed to the drawings, plus 10 sheets of drawings with most parts rendered full scale. Easy construction - no welding or complex machining. Detach outrigger with 3 pins - folds after removal. This is a proprietary design, and a patent shall be applied for in the near future. A LICENSE (plans included) to construct a railbike in accordance with these plans may be purchased for $25 (US DOLLARS). A Railbike - LIST of Parts and Materials can be seen here. Nobody has commented on the possibility of taking a normal bike with wheel rims without tires. This would need wide rims to fit around the top of the rail. This would involve a certain amount of wear of the rim though. Not the answer you're looking for? Browse other questions tagged conversion draisine or ask your own question. i have an se dirt jumper with 4 sealed bearings in the rear hub, can i convert it from QR to solid axle? Can one replace double chainrings with a singlespeed chainring on the original crankset/spider? Can I use an old cog for my new hub? Can a 12x142 rear hub and 15mm front hub be converted to 9mm quick release with an adapter? Campagnolo single speed conversion - can I use a 10sp cog? Can I install/convert a Giant Quick-e+ 2019 to use an Alfine 11 speed IGH?